In the emerging economy content is currency. Everyone knows about the radical shift: Producing and distributing content is no longer the dominion of large, well-funded players. Today anyone with Internet access can produce and distribute content. Two years ago I wrote about how content marketing is the exclusive tactic used to promote George Bowers Grocery, the specialty grocery/cafe/beer garden my husband and I own. Content is the key driver of our marketing initiative. The freedom to create this “new currency” is exhilarating to business owners. Not just for small business owners, but for large corporations. Yet, confusion exists. What content? How much? How frequently? Where, how, and why? Chad Pollitt, Director of Inbound Marketing at Kuno Creative, recently released the “Content Marketing Manifesto,” a document that does a great job of explaining key content marketing concepts. Notably, he shows how one tactic — increased blogging — can dramatically increase the volume of Web traffic, social shares, and leads. Well, the world is awash with blogs! Simply blogging isn’t a magical, golden ticket once the writer hits Spell Check+Save. So what process makes results like the ones demonstrated in the “Content Marketing Manifesto” possible? SixEstate has developed an effective system we call Newsblogging. Newsblogging is a collaborative process between journalist, editor, and search specialist that synthesizes original investigative reporting in a timely fashion for the sake of transparency and integrity, which doubly creates favorable search results and ongoing thought leadership credibility. SixEstate clients can vouch for the numerous, positive effects regular blogging has on the bottom line when a company follows the industry news curve. Our clients have experienced similar, dramatic results. The benefits of regular blogging include but are not limited to: building credibility, establishing a firm thought leadership position, and enjoying widespread search visibility with the release of timely content. Let’s not forget the additional benefits, either. 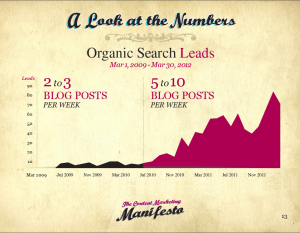 Exhibit A: an increased number of leads blogging brings, as demonstrated in the “Manifesto”! Kuno’s “Content Marketing Manifesto” brings to mind an earlier video produced by the U.K.-based Idio Platform. Using the same title, the video elegantly and effectively uses visual design to demonstrate content marketing principles. The video may be momentarily jarring until you realize what’s going on… This is apt to those concerned with marketing a business today: It’s jarring when the old methods do not work, but exciting to understand how things have changed and what appropriate action to take. Consistent, quality blogging is just one custom-content tactic that works. Today’s businesses should be investing in content because each piece adds value to the last. Content, after all, is the new currency. Image by Kuno Creative, used under Fair Use: Reporting.